During an April 18-20 residency at WMA, collaborative artists Jared Ragland and Cary Norton will visit historic Native American sites throughout the Wiregrass as part of their ongoing project, Where You Come From is Gone. Created during Alabama’s bicentennial celebration, Where You Come From is Gone explores the importance of place, the passage of time, and the political dimensions of remembrance through the wet-plate collodion photographic process. Ragland and Norton’s images seek to make known a history that has largely been eliminated and make visible the erasure that occurred in the American South between Hernando DeSoto’s first exploitation of native peoples in the 16th century and Andrew Jackson’s Indian Removal Act 300 years later. 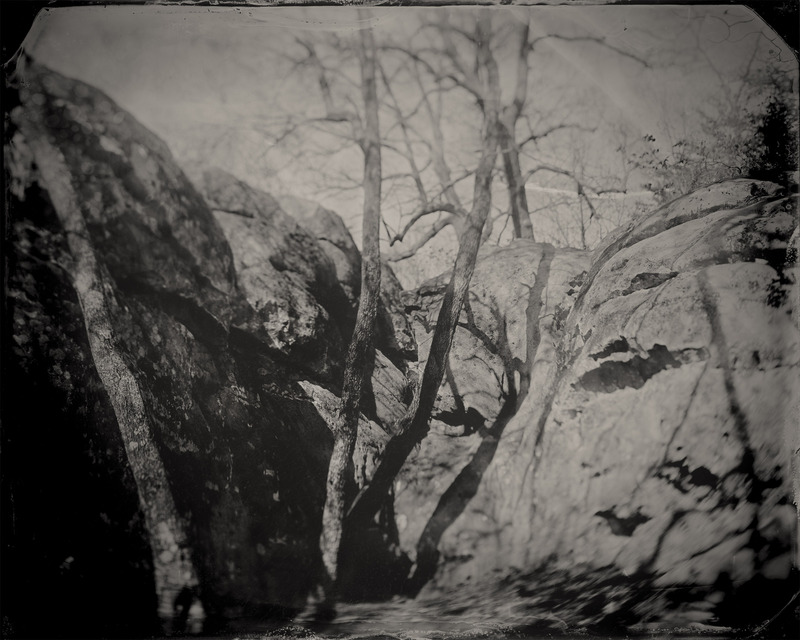 Using a 100-year-old field camera and a custom portable darkroom tailored to Ragland’s 4×4 truck, the two photographers have journeyed more than 2,000 miles across 20 Alabama counties to locate, visit, and photograph indigenous sites. Read more about Jared and Cary’s collaborative work as GUSDUGGER here. Jared Ragland is a fine art and documentary photographer and former White House photo editor. He is the photo editor of National Geographic Books’ The President’s Photographer: Fifty Years Inside the Oval Office and has worked on assignment for NGOs in the Balkans, the former Soviet Bloc, East Africa and Haiti. In 2015, Jared was named one of TIME Magazine’s “Instagram Photographers to Follow in All 50 States,” and he is a recipient of a 2017 Alabama State Council on the Arts fellowship. His work has been exhibited internationally and collected by institutions including the Archive of Documentary Arts at Duke University, the Beinecke Rare Book & Manuscript Library at Yale University, Birmingham Museum of Art, Chrysler Museum of Art, Contemporary Art Center New Orleans, and the Phoenix Art Museum. Jared is an alumnus of LaGrange College and a graduate of Tulane University with an MFA in Photography. He resides in his hometown of Birmingham, Alabama. Cary Norton is a fine art and editorial photographer, camera builder, and beekeeper. In 2009 he received worldwide recognition for building a 4×5” field camera from LEGO blocks, and he is currently at work constructing a custom mammoth-plate large format camera from locally-sourced lumber and iron. Cary has worked on long-term assignments in London and Baghdad and worked with NGOs in India, Kenya, and Uganda. In addition to client work for Ford Motor Co., Regions Bank, Verizon and Whole Foods Market, his photographs are in the collection of the Ogden Museum of Southern Art and have been published by Smithsonian Magazine, Southern Living, and The New York Times. Cary is an alumnus of Samford University, and he resides near his apiary in the Avondale neighborhood of Birmingham, Alabama with his wife, Stephanie, and their two Dachshund rescues, Fin and Munch. This exhibition has been made possible by the Alabama Bicentennial Commission.